It’s cold here in the Midwest, so in my estimation it’s always casserole o’clock. Casseroles are easy—plop a bunch of stuff into one dish, pop it in the oven, see ya in 45 minutes. I was two casseroles into fall this year when the inventor of the green bean casserole, Dorcas Bates Reilly, sadly passed at age 92. In her memory, I texted my mom and asked about other related recipes she had in her repertoire so I could continue paying tribute to the great art of the hot dish. No, ham balls is not a casserole, but it’s a traditional potluck dish from Iowa my mom remembered was included in my elementary school’s fundraiser cookbook. We then (together, via texting) flipped through the 19-year-old book’s pages for further research, where we discovered five recipes for ham balls alone. Mysteriously, graham crackers are essential to this dish. Having spent 10 formative years in the Hawkeye State, I ate a lot of casseroles, and a lot of ham, but never these. 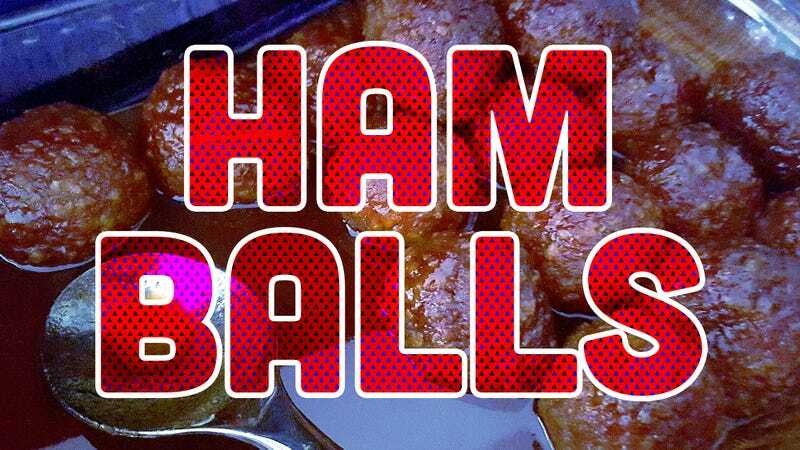 I thought it proper to try these ham balls out. I selected the hammiest recipe; meaning, no other animal proteins were added in. (Some recipes also call for ground beef.) You’ll note the need for ground, cured ham. This doesn’t really exist as far as I could find, so I bought a small cured and sliced ham that was the closest to one pound, and whazzed it up in my food processor. That in itself made me feel very Iowan. The rest of the prep is easy: put in bowl, mix with other ingredients. Form balls. After baking, what came forth from my casserole dish were 37 tomato-soup-hued glossy spheres, steamy and slightly browned. I couldn’t bear to eat them without a side dish, so I recommend a green vegetable of any kind to balance the rich, salty flavors. Final verdict: They’re tiny, really hammy meatballs with a sweet meatloaf glaze. The balls kept their shape really well, even when slicing them in half with my fork. They’re salty, so serve them alongside a good starch, a crisp-cooked veggie, and maybe some extra ham ball sauce. It’s a great use of leftover holiday hams or when you want to impress your friends with a true Iowan dish of balls. Adapted from the Ham Balls recipe in “Johnston Schools Cooking Up a Storm,” 1989 edition, submitted by the Thoreson Family of somewhere near Johnston, Iowa. Mix ham, pork, crackers, eggs, onions, and milk and roll into balls 1 1/2-to-2 inches wide. Arrange in a single layer in a 9-by-13-inch glass baking dish. Set aside. Combine sauce ingredients in a small bowl with a fork or whisk. Drizzle sauce evenly over ham balls before baking. Bake at 300 degrees Fahrenheit for 1 to 1 1/2 hours.